379 Beacon is located on the south side of Beacon, between Fairfield and Gloucester, with 377 Beacon to the east and 381 Beacon to the west. 379 Beacon was designed by architect Frederick B. Pope and built ca. 1869, one of ten contiguous houses built as five symmetrical pairs (377-379-381-383-385-387-389-391-393-395 Beacon), each house on an 18 foot wide lot and each pair united by a shared portico. 377-379 Beacon are one story higher than the other four pairs, and probably were built that way (they appear as such on the 1887 Sanborn map). Click here for an index to the deeds for 379 Beacon. On November 1, 1869, 379 Beacon was purchased from George Gibson by Harriet S. (Loring) Johnston, the wife of stockbroker Thomas A. Johnston. 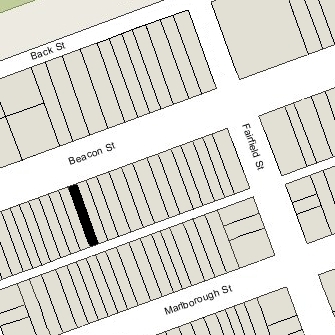 They lived at 165 Charles Street and do not appear to have moved to 379 Beacon. On August 5, 1870, 379 Beacon was purchased from Harriet Johnston by Mary Caroline (Goddard) Goddard, the widow of David Goddard. Living with Mary Goddard were her son-in-law and daughter, attorney Samuel Appleton Browne Abbott and Mary (Goddard) Abbott, and her two unmarried children, Lucy W. Goddard and Thatcher Goddard, a medical student. Her mother, Mary (Goddard) Goddard, the widow of William Goddard, also lived with her. They all previously had lived at 10 Pemberton Square. Mary Abbott died in January of 1871 and Samuel Abbott moved to 6 Arlington to live with his parents, Josiah Gardner Abbott and Caroline (Livermore) Abbott. He remarried in October of 1873 to Abby Francis Woods; after their marriage, they lived at 11 Exeter. Mary Goddard’s mother, Mary Goddard, died in January of 1878. Thatcher Goddard married in March of 1876 to Hannah F. Watson; after their marriage, they lived with his mother and sister, Lucy, at 379 Beacon. They continued to live at 379 Beacon during the 1881-1882 winter season, but moved thereafter to Newport. On June 1, 1882, 379 Beacon was purchased from Mary Goddard by Harriet A. (Ellery) Mills, the wife of Isaac B. Mills. They previously had lived at 15 Temple. He was a dealer in cooperage stock. Isaac Mills died in June of 1889. Harriet Mills continued to live at 379 Beacon during the 1889-1890 winter season, but moved thereafter to 82 Huntington. On March 31, 1890, 379 Beacon was purchased from Harriet Mills by cigar manufacturer William N. Fisher. He and his wife, Rebecca (Crockett) Fisher, made it their home. They previously had lived at 44 S. Russell. On December 23, 1901, he transferred the property into his wife’s name. The Fishers continued to live there during the 1902-1903 winter season, but moved thereafter to 623 Commonwealth. 379 Beacon was not listed in the 1904 Blue Book. On September 23, 1904, 379 Beacon was purchased from Rebecca Fisher by Adela Pegram (Myers) O’Neil, the wife of Dr. Richard Frothingham O’Neil. They previously had lived at 416 Marlborough. They also maintained a home in York Harbor, Maine. Richard O’Neil was a physician and surgeon specializing in genito-urinary surgery. He maintained his office at 379 Beacon. From 1905 through 1912, Dr. Franklin Spilman Newell, an obstetrician, also lived and maintained his offices at 379 Beacon. He had moved to 443 Beacon by 1913. From about 1924, Dr. William Henry Smith, an instructor at Harvard Medical School and physician, was a lodger with the O’Neils. He had lived at 10 Gloucester in 1917 and in Brookline in the early 1920s. Dr. Smith maintained his office at 8 Marlborough. Richard O’Neil died in November of 1944. Adela O’Neil continued to live at 379 Beacon until shortly before her death in January of 1949. Their son, Richard F. O’Neil, Jr., a broker, lived with her. Dr. Smith also continued to live at 379 Beacon until about 1946, after which he made 8 Marlborough his home as well as his office. On October 26, 1948, 379 Beacon was acquired from Adela O’Neil by Miss Ruby E. Burgess. 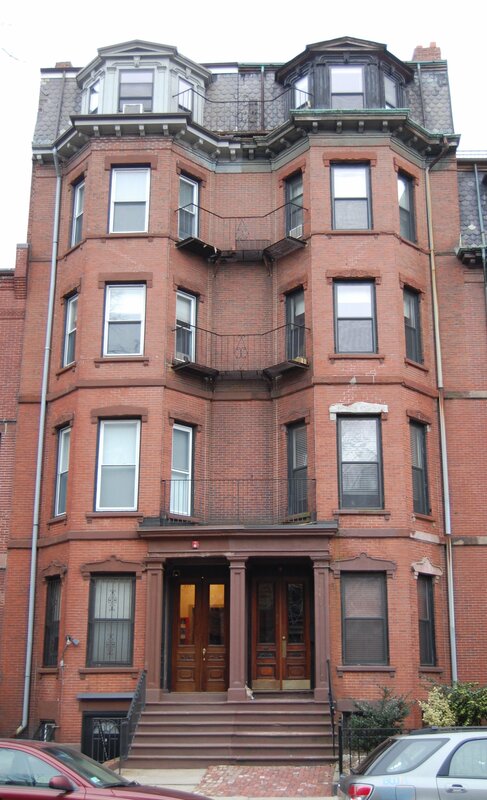 She previously had lived at 103 Shawmut. She operated 379 Beacon as a lodging house. On June 7, 1950, 379 Beacon was acquired from Ruby Burgess by Charles (born Beshara) George Leon, an electrician. He and his wife, Rebecca M. (Sullivan) Leon, lived in West Roxbury. In April of 1951, he filed for (and subsequently received) permission to legalize the use of the property as a lodging house. On August 21, 1962, Charles Leon transferred 379 Beacon to himself and his wife as trustees of the Nole Realty Trust. They continued to operate it as a lodging house. On August 25, 1976, 379 Beacon was purchased from the Leons by real estate dealer Patrick J. Glynn. In November of 1987, he filed for (and subsequently received) permission to convert the property from a lodging house into twelve apartments. On January 22, 1991, he transferred the property to himself and his wife, Anne T. (Kelly) Glynn, as trustees of the 379 Beacon Street Trust. 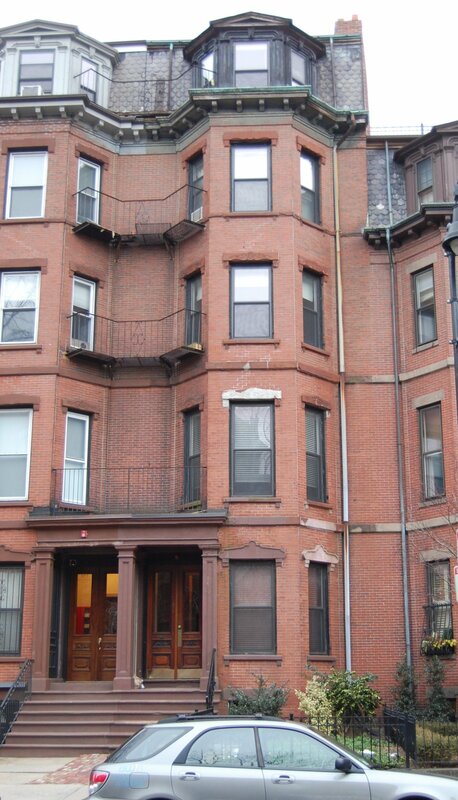 On May 15, 1997, they transferred the property to the 379 Beacon Street Limited Partnership. 379 Beacon remained an apartment house in 2017.